Click here for the Book Summary​! ​Click here for the Book Summary! Rework shows you a better, faster, easier way to succeed in business. Read it and you'll know why plans are actually harmful, why you don't need outside investors, and why you're better off ignoring the competition. The title refers to the author’s belief that business owners–typically brimming with good but distracting ideas–make poor entrepreneurs. The “E” in E-Myth is for Entrepreneur. Gerber takes time to explain how most business owners fall into a trap that they set for themselves. The way out of the constant “doing it, doing it, doing it”, is to learn true Entrepreneurship and work on your business rather than working in your business. Peter Thiel shows how we live in an age of technological stagnation, even if we’re too distracted by shiny mobile devices to notice. Information technology has improved rapidly, but there is no reason why progress should be limited to computers or Silicon Valley. Progress can be achieved in any industry or area of business. It comes from the most important skill that every leader must master: learning to think for yourself. The bestselling classic that launched 10,000 startups and new corporate ventures - The Four Steps to the Epiphany launched the Lean Startup approach to new ventures. It was the first book to offer that startups are not smaller versions of large companies and that new ventures are different than existing ones. The book offers the practical and proven four-step Customer Development process for search and offers insight into what makes some startups successful and leaves others selling off their furniture. Ready, Fire, Aim has what you need to succeed in your entrepreneurial endeavors. In it, self-made multimillionaire and bestselling author Masterson shares the knowledge he has gained from creating and expanding numerous businesses and outlines a focused strategy for guiding a small business through the four stages of entrepreneurial growth. I follow Pat's blog and his podcasts, so I was expecting a good experience when I picked this one up. But wow - was I blown away! Pat has a refreshing & approachable take on how to go about building a product with the correct mindset. The anectodes he uses throughout the book had me smiling fondly as I flipped page after page. An entertaining , educational & motivational read packaged with practical steps to launch your own product! Traction will teach you the nineteen channels you can use to build a customer base, and how to pick the right ones for your business. It draws on inter-views with more than forty successful founders, including Jimmy Wales (Wikipedia), Alexis Ohanian (reddit), Paul English (Kayak), and Dharmesh Shah (HubSpot). 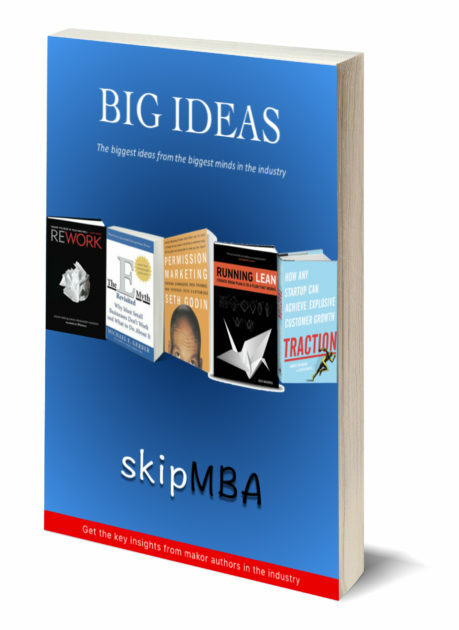 This book provides startup founders and employees with the framework successful companies have used to get traction. Now this Internet pioneer introduces a fundamentally different way of thinking about advertising products and services. By reaching out only to those individuals who have signaled an interest in learning more about a product, Permission Marketing enables companies to develop long-term relationships with customers, create trust, build brand awareness -- and greatly improve the chances of making a sale. The book that revolutionized marketing — making it no longer solely about the product, but more so about the prospects perspective. Al Reis provides us with strong arguments against the traditional corporate marketing and their stubborn hold on to line-extension. With his witty, fast-paced & unapologetic style, he tells us how to use our current position it's best advantage instead of playing into the competitions hands. I'm not entirely certain if this book belongs in the marketing section, but it definitely belongs on the DIY MBA Reading List. Blue Ocean Strategy is packed with crucial readings for any business & marketing strategy leader. The authors argue that lasting success comes not from battling competitors but from creating “blue oceans”—untapped new market spaces ripe for growth. Another Al Reis Classic , but I would say that the use of the word "Immutable" is rather bold. However, the book does provide good food for thought. There are extensive examples that you may very well find yourself using as a reference point in your strategic marketing decisions. From the Law of Leadership, to The Law of the Category, to The Law of the Mind, these valuable insights stand the test of time and present a clear path to successful products. Violate them at your own risk. The Tipping Point is that magic moment when an idea, trend, or social behaviour crosses a threshold, tips, and spreads like wildfire. Just as a single sick person can start an epidemic of the flu, so too can a small but precisely targeted push cause a fashion trend, the popularity of a new product, or a drop in the crime rate. Wow — a diamond in the rough. A sales classic endorsed by Dale Carnegie himself. This book hold timeless knowledge. Frank Bettger went from a 29 year old failure to owning his own country estate by 40. Bettger reveals his personal experiences and explains the foolproof principles that he developed and perfected. He shares instructive anecdotes and step-by-step guidelines on how to develop the style, spirit, and presence of a winning salesperson. What makes success in major sales? How do some salespeople consistently outsell their competition? Why do techniques like closing work in small sales but fail in larger ones? How can salespeople dramatically increase their sales volume from major accounts?Now you can find answers to all these questions with the SPIN strategy. Even if you think you know it all, there's probably an ingredient or two that you're missing. Robert B. Cialdini discusses the techniques used get people to say "yes" , and how to avoid being exploited by these techniques yourself. Cialdini goes over the techniques of Reciprocation, Commitment, Social Proof, Liking, Authority and Scarcity - all of which are used to bring about compliance with another human being. An enjoyable read filled with anecdotes! Over the past 13 years, he has used his one-of-a- kind method to raise more than $400 million and now, for the first time, he describes his formula to help you deliver a winning pitch in any business situation. Whether you re selling ideas to investors, pitching a client for new business, or even negotiating for a higher salary, Pitch Anything will transform the way you position your ideas. Double and triple your sales—in any market. Engaging and informative, this reliable resource skillfully outlines the essential elements of the venture capital term sheet—from terms related to economics to terms related to control. It strives to give a balanced view of the particular terms along with the strategies to getting to a fair deal. A Manager's Guide to Knowing What the Numbers Really Mean, Karen Berman and Joe Knight present the essentials of finance specifically for entrepreneurial managers. Drawing on their work training tens of thousands of people at leading organizations worldwide, the authors provide a deep understanding of the basics of financial management and measurement, along with hands-on activities to practice what you are reading. Investors will find everything they need to fully understand the profit, cash flow, and financial condition of any business. God, I hated Statistics in University. I always knew that it was important though. But the content was so frigging dry. Charles Wheelan fixes that for us! He brings entertainment and statistics into one package! I didn't think that was possible, but he manages it! After finishing this book, I had a new-found appreciation for Statistics. Pick up this book and you'll be bragging about the Central Limit Theorem and how awesome it suddenly all is! Gary Smith walks us through the various tricks and traps that people use to back up their own crackpot theories. Sometimes, the unscrupulous deliberately try to mislead us. Other times, the well-intentioned are blissfully unaware of the mischief they are committing. Today, data is so plentiful that researchers spend precious little time distinguishing between good, meaningful indicators and total rubbish. Not only do others use data to fool us, we fool ourselves. Web Analytics 2.0 presents a new framework that will permanently change how you think about analytics. It provides specific recommendations for creating an actionable strategy, applying analytical techniques correctly, solving challenges such as measuring social media and multichannel campaigns, achieving optimal success by leveraging experimentation, and employing tactics for truly listening to your customers. The Art of War meets "The Artist's Way" in this no-nonsense, profoundly inspiring guide to overcoming creative blocks of every kind. A succinct, engaging, and practical guide for succeeding in any creative sphere, The War of Art is nothing less than Sun-Tzu for the soul. The One Thing explains the success habit to overcome the six lies that block our success, beat the seven thieves that steal time, and leverage the laws of purpose, priority, and productivity. People are using this simple, powerful concept to focus on what matters most in their personal and work lives. Written during the Great Depression, against a backdrop of millions of people out of work and a looming world war, Napoleon Hill's magnum opus held out hope that life could get better. While not considered part of the New Thought movement, Hill drew on many of their concepts and techniques. He prefigured the 'Prosperity Consciousness' of present-day New Age thinkers and a host of motivational writers and speakers have followed in his footsteps. A timeless business classic, Who Moved My Cheese? uses a simple parabel to reveal profound truths about dealing with unexpected change so that you can enjoy less stress and more success in your work and in your life. Stephen R. Covey presents a holistic approach for solving personal and professional problems. He reveals a step-by-step pathway for living with fairness, integrity, honesty and human dignity―principles that give us the security to adapt to change, and the wisdom and power to take advantage of the opportunities that change creates. In an introduction to the basics of the famous Customer Development Process, Steve Blank provides insight into the key steps needed to build a successful startup. The main idea in this course is learning how to rapidly develop and test ideas by gathering massive amounts of customer and marketplace feedback. Keep an eye on ya email for list-updates & free one-page book summaries!